I last left you by teasing a project I was working on in the dining room to take it from “for now” to “forever.” Well, that project is updating my grandparents’ dining room set chairs. Specifically, upholstering the seat cushions. They must have gotten the set in the 60’s, the green tweed-like fabric being very reminiscent of that era. I loved the lines of the chairs, but I knew they needed a fabric facelift. My, my, my – there are a TON of fabric options out there. I looked on pinterest and so many bloggers had lists of where they bought fabric, both in retail stores and online. Some bloggers used shower curtains or regular curtains in fabrics they loved for their projects. I must have looked at hundreds upon hundreds of fabrics to try to pick one for our dining room chairs. It’s overwhelming the number of choices! If I felt this way, I’m sure there are others who do too. So, I’m going to try to describe my decision making process, and enlist your help too. For me, step one was eliminating fabric you can only purchase online. I’m sure buying over the internet works for a lot of people, but I’m not one of them. I can’t tell true colors, I have no way of knowing how big/small the patterns are, and I have a really hard time visualizing how the fabric will look in the room with all the other furniture and decor. Online only fabrics – eliminated! Next, I looked at JoAnn Fabrics. I’ll admit, I started looking at fabrics online, but knew I’d be paying a visit to the store to see the fabric in person before buying. I found a ton of options, and that’s where you, my loyal readers, come in. 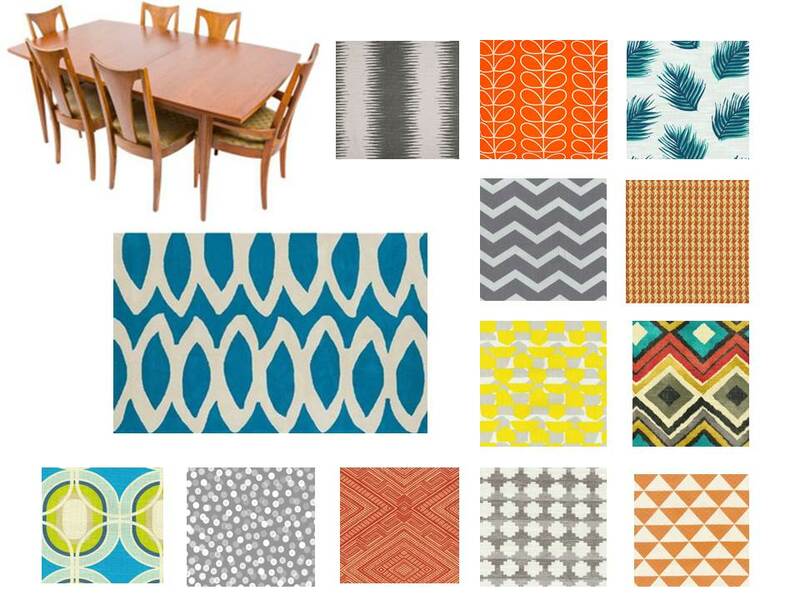 I’ve put together a little rendering of the CB2 rug we plan to keep, the dining room set, and small swatches of all the fabrics I’m pondering. Warning: there are a lot. As you can tell, I’m having trouble even nailing down a color. Orange would tie the dining room in with the living room, which has subtle orange accents in the rug, a side table, and a tray on the coffee table. Greys, yellows, and blues are found throughout the house, so those are possible colors to use too. I think the hardest thing is picking a fabric that doesn’t clash with the bright, busy rug. 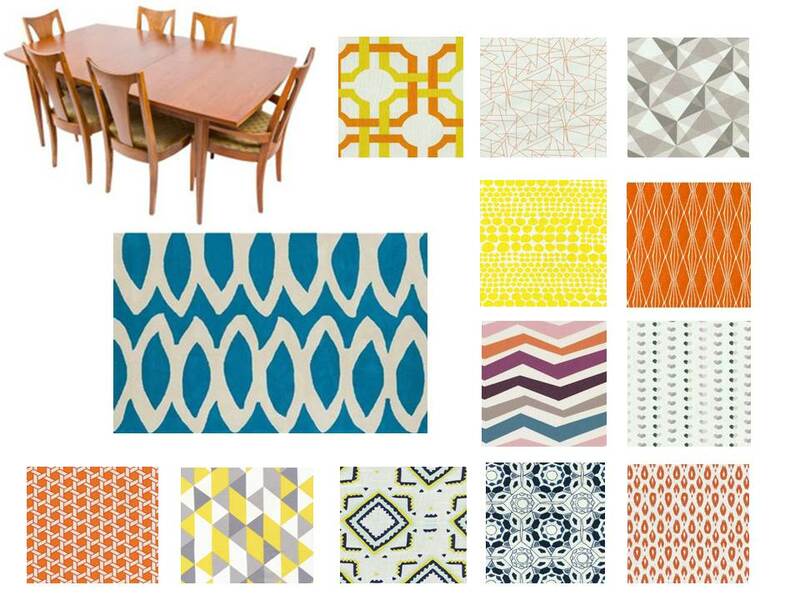 I’ve also been considering using 60’s style fabric, like the sample in the bottom left of the graphic. Does it work? Is it too period specific? Because I had so many options to mull, I had to make another graphic to even more of my choices! I think I really like the orange options, but I’m worried they don’t work with the color of the table and chairs. The wood has underlying warm tones, so I’m wondering if I should pick a fabric that is more neutral or even cool toned. I tried to stay away from fabrics that had too much white in them, for fear they would get dirty quickly, but other than that, it seems like I’m lost. To make things more complicated, I’ve started looking at curtains from Target and Kohls. Believe it or not, I’m finding curtains to be quite a cost effective options. Two 84 inch panels come in around $25. Some of the fabrics I’ve been sifting through are $20ish per yard! I estimate needing about 3 yards of fabric for this project (about half a yard per chair), and will likely need extra for mistakes. So, panels may be the cheaper route. So far, I’ve order three different sets of curtains. Two were already vetoed, and one is still in the running. With so many choices, I just can’t commit! Blog friends, I pose this question to you: Which fabric should we pick? Or, in the alternative, what do you think we should consider in our fabric choice?